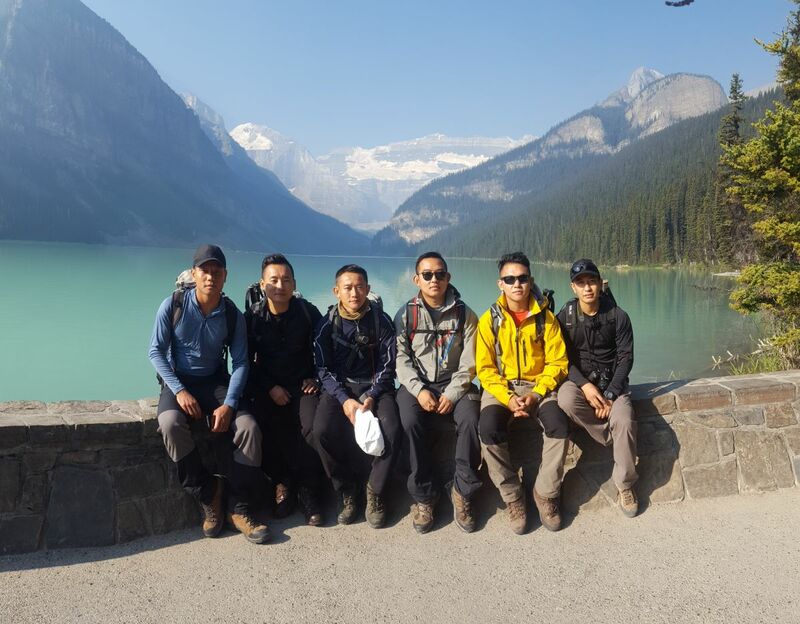 With the aim of developing leadership skills, team cohesion and morale through controlled exposure to risk in a challenging outdoor environment, Exercise GURKHA GRIZZLYS was held in August 2018 in the Canadian Rockies. It provided participating Gurkha Staff and Personnel Support Company (GSPS) personnel the rare opportunity and unique experience of undertaking Adventurous Training (AT) activities in a completely different terrain and landscape to that of the UK, promoting an AT course within the cap badge by conducting Distributed Training for the Summer Mountain Foundation Course. The expedition was organised by Warrant Officer Class Two Surendra Limbu, Expedition Leader (Exped Ldr) and a total of thirteen personnel from GSPS and two from QG SIGNALS, as lead instructors, participated in the expedition. The advance party departed to Canada on 17th August followed by the Main Body on the 19th. We were based at Trails End Camp, a sub-unit of British Army Training Unit Suffield (BATUS), 60km west of Calgary and 80km east of Canmore. The AT comprised several activities including; white water rafting, horse-trail riding, rock climbing and mountain biking and was conducted at different sites within Banff National Park, the heart of Alberta. Banff National Park is the oldest national park and one of the top tourist attractions in Canada. During the course, the highest elevation we reached was approximately 2600m – a height that enabled us to witness many of the majestic mountains, valleys, meadows and lakes of Canada. During the white water rafting there was rain and intermittent lightning and thunder but it turned out to be the most exciting and thrilling experience of all the activities. The horse-trail riding was a first for all of us, except Sergeant Gautam, it was testing yet exciting, particularly when we were trotting, making us all laugh. On the other hand, Rock Climbing and Mountain Biking gave us a new perspective towards trying a familiar activity in such a very different location. Personally, I feel very fortunate to be part of such a fantastic expedition with an amazing group. Besides being beautiful, I reckon that Canada must be one of the best countries to conduct AT in. Finally, my heartfelt thanks to our Exped Ldr and 2IC, Sergeant Rakam, for making the Exercise such a success for all of us.